Hardee's and Carl's Jr. have initiated a new customer participation promotion called Burger Slayer. The object of the 'game' is for customers to snap a photo of themselves devouring -- or "slaying" -- their favorite Carl's Jr. or Hardee's menu offering and then submit it for posting online. Photos can be submitted via the Carl's or Hardee's websites or by e-mailing them to either carlsjr@burgerslayer.com or hardees@burgerslayer.com. 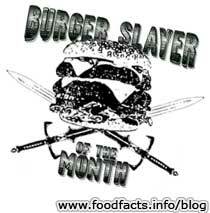 Photos are voted on by site visitors and the winner is crowned "Burger Slayer of the Month." The winner's photo and bio (if desired) are posted on the sites and they receive free burgers for a month. The competition will renew monthly. The sites will be marketed in the restaurants and word of the offer will be circulated via social networking sites such as MySpace.com, photo sharing networks such as Flickr, and banner ads on Yahoo!